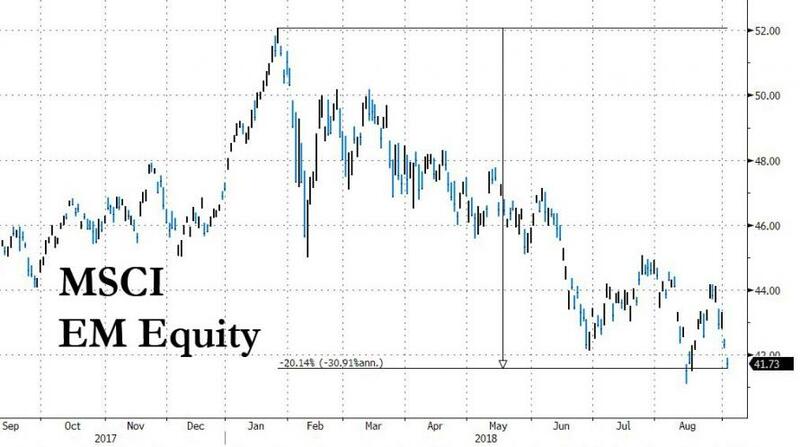 Don't look now - or look - but while the US stock market trades just shy of all time highs, absent the occasional hiccup in the mighty FANGs, the rout across emerging markets is now the longest since the global financial crisis, or specifically 222 days for stocks, 155 days for currencies, and 240 days for local government bonds. The duration of each selloff - as calculated by Bloomberg - had taken even the most ardent bears by surprise because "not one of the seven biggest selloffs since the financial crisis - including the so-called taper tantrum - inflicted such pain for so long on the developing world." 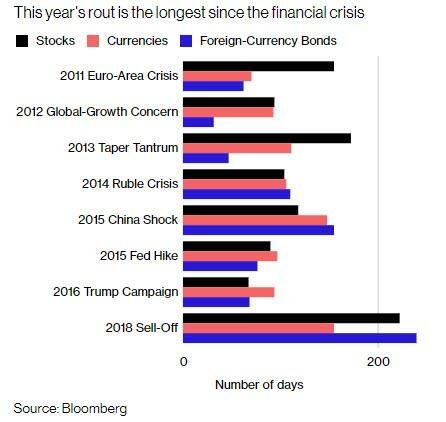 The slump and the duration, calculation in the number of days from peak to trough, has pushed some strategists to say the EM crisis is more than just a knee-jerk reaction to higher U.S. interest rates or the unfolding trade war: "It’s become a full-fledged crisis of confidence for investors in developing nations." The duration of the decline also impacts trader behavior, as lingering downtrends upend futures and options contracts, forcing traders to take losses. They also lock up investors’ collateral in the form of enhanced margin calls, leaving them little room to make other trading decisions, as Bloomberg notes. More importantly, the longer selloff also means the argument for buying the dip - one frequently made by money managers earlier this year - gives way to cautions over avoiding a falling knife. And that, in turn, can persuade money managers who treat emerging markets as one homogeneous group to sell weak and strong markets in tandem, no matter their specific fundamentals. It’s the very definition of contagion. 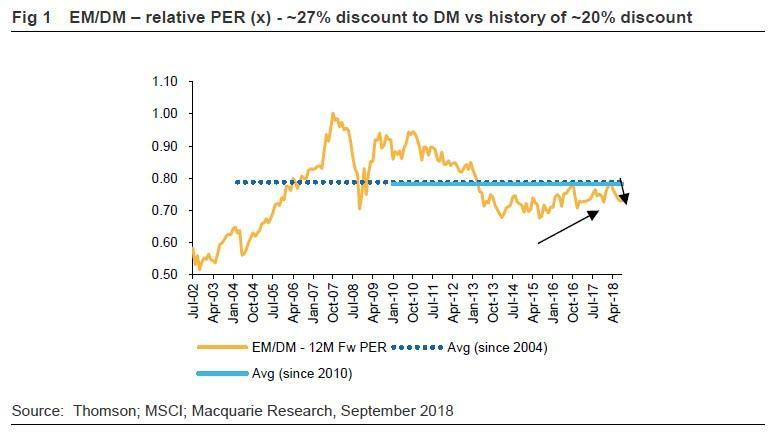 One strategist who would agree with the gloomy assessment that the EM crisis is in its contagion phase, is Macquarie's Viktor Shvets who in a note released today, titled appropriately "Catching falling knives & EM contagion" explains - once again - what prompted this particular EM crisis, and why it will be so difficult to exit it. EM equities are continuing to underperform; down 20% from high (Feb’18). And while immediate drivers are weaker EMs, the causes are broad & persistent: these are liquidity compression, US$ & shutdown of growth engines. CBs and China can reverse this trend; alas, at this stage not enough from either. EM equities are continuing to underperform DMs, as vulnerable EMs refuse to accept unpalatable choices and the global & US$ liquidity continues to compress. Despite our expectation of some relief, EMs’ underperformance continued to build through the summer. Since the high (Feb’18), EMs underperformed DMs by ~15%, adding effectively another 3-4% in the last two months. The same occurred to funds flow, with Asia ex equity flows to market cap approaching 0.5% (negative) as ~US$32bn left the universe. While valuations are not yet distressed, the multiples (PER) are today trading at ~27% discount (vs historic average of ~20%). Is it the right time to get into EMs, particularly as there are already tentative signs of some return of foreign flows? The key to determining whether the time is right is the degree of contagion from periphery to sturdier parts of the EM universe. We believe that it is totally incorrect to argue that Turkey’s US$0.5 trillion of FX debt (~8% of entire EM FX debts) is not systemic. In our view, Turkey is highly systemic, from both financial & geopolitical perspective. Besides, if history is any guide, the straw that breaks the camel’s back does not actually need to be critical (it could just easily have been Hungary, for example). The key to contagion is not geography or size of the initial victim but rather assessment of responses and the impact on global and regional liquidity flows. This in turn is determined by reactions of not just countries involved but also of any committee that might have been formed to ‘save the world’ (a la LTCM in ’98, Brady bonds in ‘80s). The challenge with Turkey and Argentina is not only that these two economies have unsustainable twin deficits and suffer from massively rising inflationary pressures, but also that their responses thus far were either slow or hostile. In reality both face politically unpalatable choice of either deep recession or some form of capital controls & debt renegotiation. The position of other EMs is not as extreme; but it matters little, as long as there is no change in global liquidity. This remains the key. As long as global CBs insist on reducing liquidity while simultaneously attempting to raise cost of capital, victims would continue to float to the surface, starting with weaker players but then gradually spreading to the sturdier corners. 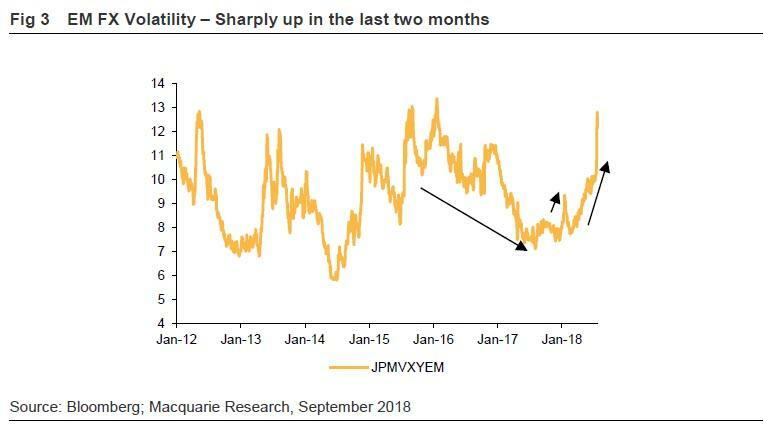 We have already seen a significant rise in EM currency volatilities and a rise in EM and high yield spreads. In addition, investors are coming to terms with the US seeming willingness to ‘weaponise’ trade & US$, while technology and de-globalization are shutting down EM growth engines. 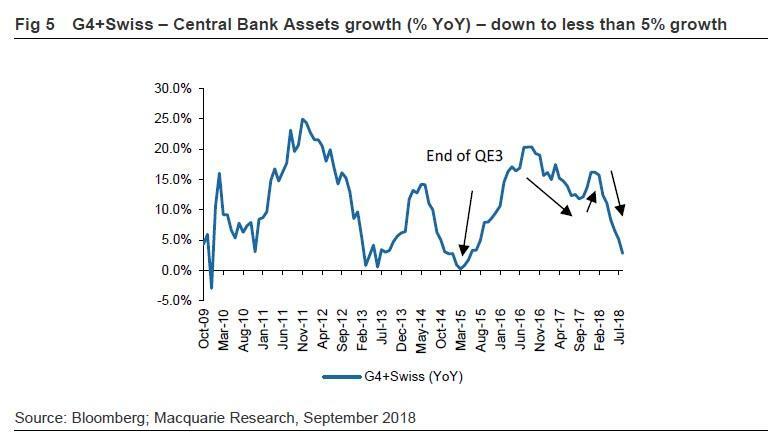 We estimate that the global liquidity growth now stands at less than 5% (not enough to cover global GDP; providing nothing for assets) while US$ liquidity is turning deeply negative, thus supporting US$. But on the other hand, China is moving towards more stimulative position. How do we balance these factors? Unless there is a stronger private sector recovery or China becomes more aggressive, CBs must change their narrative. At this stage, we still don’t see committees to ‘save the world’.